I wonder if anyone in the know knows anything about vertical Spencer pianos made AFTER 1942 (when the orginal Spencer company ceased business I gather). 2. history and average quality, problems if known. One of my relatives bought a piano some years back (late 80's) BRAND NEW purporting to be a Spencer. From what I know I think it may be a relatively small studio or console piano with a relatively modern 'European' minimalist design (no legs supporting the keyboard, clean lines). It's apparently in need of tuning and I suspect regulation as well. Unfortunately I am currently err... geographically challenged and won't be able to actually see this instrument for at least a few weeks, so I can't really tell you more about serial no's. or markings (but I certainly will). I've tried googling for it, but not much info is available out there. There certainly isn't a Spencer site or reference to anything other than the 'old' Spencer piano company. 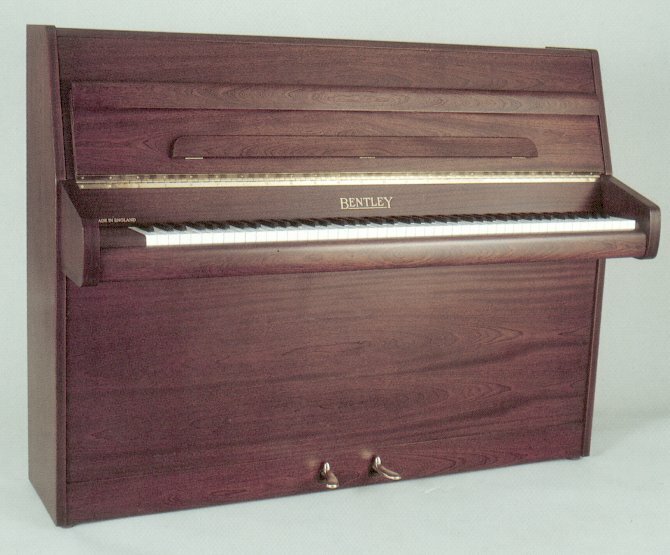 I believe this piano is new as described to me, so the big question is who built it, where did it come from and what issues are there with it? Thanks very much in anticipation! The piano making firm of Spencer was established. Spencer & Co. and Malcolm and Co, were two substitute companies of Murdoch and Murdoch, they became one of the largest retailers of Musical instruments in the UK, who made their own pianos. According to Pierce Piano Atlas "Piano number 38833 was made for HRH the Princes of Wales" In the summer of 1986, under new ownership, Spencer Pianos ceased to be known by that name it became Miltone Spencer and soon after ceased trading. Thanks, Barrie, that's very helpful. The picture - if I recall correctly that's exactly how the piano in question looked like except that it had 'Spencer' stencilled on it instead. So it's most likely made in Gloucester by Bentley and not knocked up in China or Korea. That's probably good isn't it ? When I get back I'll probably get someone to look it over properly. Cheers! Probably a little bit of a late reply for you but here goes. and from 1985 to 1989 by Miltone spencer piano company. Both companys were based in Milton Keynes. worked for Zender Pianos for 30 years before they closed. My father, Brother and myself worked on the factory floor. finish and was only supplied to Schools in the Staffordshire area. under damper action and same string configuration. Hi thats interesting news i have a spencer it actually has the date of sep 11th 1984 and a badge on plate with union jack emblem and wakefield spencer so i asssume it was one of the last pianos made by them before your family took over?